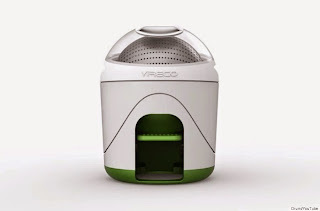 Well, if you are currently in such a living situation, a company by the name of Yirego has created a small, foot-operated washer, The Drumi, that may help lessen the dread of Laundry Day. Or at least help you avoid weekly trips the 'mat. Those that are too busy (or just plain old lazy..) can throw in some necessary pieces each week and skip the trip outside of their home to wash. The Drumi is foot-powered, and can clean about three days' worth of personal undergarments and shirts in about 5 minutes. It uses approximately 2 gallons of water per load and only a little soap, which according to Yirego is 80 percent less water and detergent than what's required by regular washing machines. Yirego told The Huffington Post that the Drumi will retail for a promotional price of $129 until April 23, after which it will retail for $169. The product will officially hit the market this summer, but the company is currently accepting pre-orders from Canadian and US residents. Now, if they could just create an accompanying dryer..